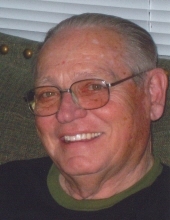 James "Jim" E. Woods, Jr. Celebrating the life of James "Jim" E. Woods, Jr.
Obituary for James "Jim" E. Woods, Jr.
James E. Woods, Jr., age 83, of Sullivan, Missouri, passed away Monday, January 14, 2019 at his home, surrounded by his family. James, known as Jim, was born on March 15, 1935 in Sullivan, Missouri, to James E. Woods, Sr. and Harriet (Harmon) Woods. Jim attended Reed’s Defeat School, where he finished eighth grade, and graduated from Sullivan High School, Class of 1953. Upon completing high school, Jim began work at Midwest Footwear. During this time, he met Betty Blankenship and they were united in marriage on May 7, 1955. One daughter, Becky Jo, was born to their happy home just over a year later. Jim then purchased the Shell Service Station, which he owned and operated for approximately two years. He then decided to sell the station and went to work for International Shoe Machine, where he traveled as a machinist for five years. In 1962, Jim was offered a job at the Bank of Sullivan, where he would spend the rest of his career. After 37 years of service, he retired in 1999. Jim enjoyed hunting and fishing, horses and trail rides, boating, and trading vehicles. Jim and Betty enjoyed traveling together, especially following their retirement. Although he was a true introvert at heart, Jim was very well liked by all who encountered him. He is survived by his wife, Betty (Blankenship) Woods of Sullivan; one daughter, Becky Waterman of Sullivan; one granddaughter, Jennifer Salmon and husband, Vance, of Springfield, MO; three sisters, Helen Ruwwe of Sullivan, Bonnie Medling and husband, Jack, of Sullivan, and Donna Rutledge and husband, Larry, of Union, MO; numerous nieces and nephews, other relatives and friends. Jim was preceded in death by his parents, James Everett Woods, Sr. and Harriet (Harmon) Woods; and two sisters who died in infancy, Linda and Carolyn Woods. Funeral services will be conducted at 1:00 PM, Friday, January 18, 2019 at the Eaton Funeral Home in Sullivan, with Pastor Kyle Phillips officiating. Visitation will be held from 11:00 AM to 1:00 PM, Friday, at the Eaton Funeral Home in Sullivan. Friends may send online condolences to the Woods family at www.eatonfuneralhome.com. In lieu of flowers, donations may be made to Mercy Hospice or the Backpack program at Grace United Methodist Church in Sullivan. To send flowers or a remembrance gift to the family of James "Jim" E. Woods, Jr., please visit our Tribute Store. "Email Address" would like to share the life celebration of James "Jim" E. Woods, Jr.. Click on the "link" to go to share a favorite memory or leave a condolence message for the family.